Thomas J. “Coach” Detelich, 85, of Conneaut Lake died Saturday, November 3, 2018 at Rolling Fields. He was born August 30, 1933 in Greenville, PA a son of Mato and Marie Milanovich Detelich. He was a 1951 graduate of the former Penn High School in Greenville and later attended Thiel College where he was a standout quarterback setting many school records and Youngstown State University where he graduated with a degree in history and physical education in 1963. Thomas was a veteran of the Korean War serving in the US Army from 1953-1955. While in the service he was a boxer winning many unit matches. He student taught at Penn High School and coached at St. Michaels in Greenville. He started his teaching and coaching career in Wooster, Ohio, then moved to Vienna, Ohio. 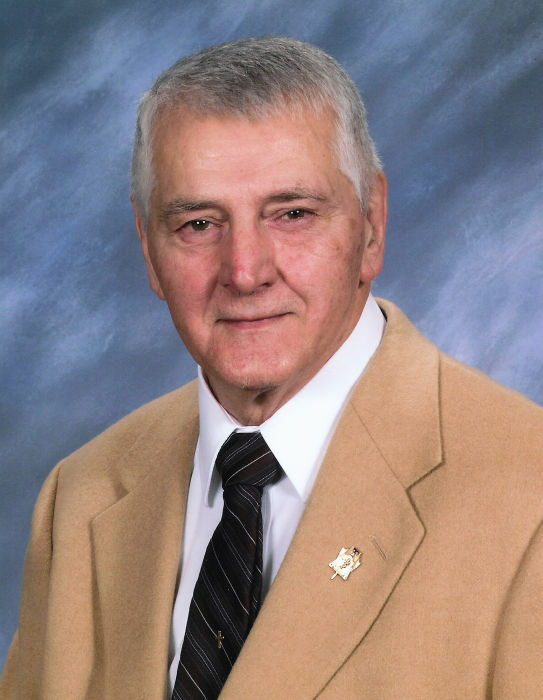 He spent most of career teaching and coaching for Conneaut Valley and Conneaut Lake high school until retiring in 1993. Thomas was a coach in numerous sports including basketball, football, cross-country, volleyball, wrestling, and baseball. He was a member of the St. Michael’s Church in Greenville and later attended Our Lady Queen of Americas Church in Conneaut Lake. In 2001, he was inducted into the Mercer County Athletic Hall of Fame. He was also a member of the VFW Post 3374 in Greenville, a past commander of the Conneautville American Legion Post 615, and a member of Conneaut Lake VFD Station 3 and Conneaut Lake Park VFD Station 5. Thomas enjoyed music and following his son’s band, Repeat Offenders. He also loved to golf, dance, walk his dog and tell jokes. Survivors include: long-time companion and fiancée Barbara Morgan; two sons, Thomas J. Detelich, Jr. (Amy) of Conneaut Lake and David Detelich (Karen) of Linesville; three step-sons, James Morgan (Christina) of Greenville, Scott Morgan (Stacey) of Jamestown, and Sean Morgan of Jamestown; five grandchildren, Jacqueline, Lillian and Thomas Detelich, Ashley and Justin Zazado; three great-grandchildren, Adasyn, Carson, and Braelyn; six step-grandchildren; two step-great-grandchildren; a brother Matthew Detelich (Kay) of Greenville; a brother-in-law Ray Bartolo; numerous nieces and nephews; and his beloved dog Mike. In addition to his parents, he was preceded in death by a brother, Robert Ray; and three sisters, Mildred Petzak, Zora Lock, and Mary Bartolo. Calling hours will be Tuesday, November 6th from 2-4 p.m. and 6-8 p.m. at the WAID-COLEMAN FUNERAL HOME, 12422 CONNEAUT LAKE RD., CONNEAUT LAKE. Mass of Christian Burial will be Wednesday, November 7th at 11 a.m. at Our Lady Queen of Americas Church, 155 S. 9th St., Conneaut Lake with Fr. Jeffery Lucas, celebrant. Interment will be at the Shenango Valley Cemetery, Greenville. Memorials may be made to the Wounded Warriors Project at, 4899 Belfort Rd., Suite 300, Jacksonville, FL 32256 or www.woundedwarriorproject.org.